I have never used one before but the guys at work told me how one is suppose to work, so I plugged it in, put air to it and started hacking on some scrap metal hanging around. It was awesome. Not sure how it would compare to the other big name brands but i was cutting 1/4" plate fairly easily. Don't know how well it would work on thicker material, but for a home warrior, I imagine that it will serve it purpose well. 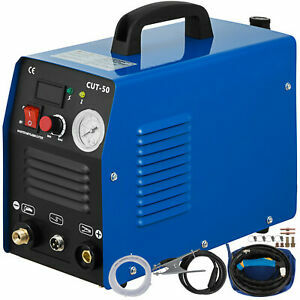 Came with 30A 220VAC twist-lock plug on it which was very good for me since my welder outlet is 30A twist-lock also. Cutting 4" wide 1/4" thick piece of steel at 50 Amps, cut for three inches then, pop! Breaker tripped, turned out a small transformer and 2 mosfets exploded inside. It's rated for at least a 3.5 minute duty cycle at full power on .47" steel, didn't make it. Probably ok for tin like hobby craft, but not even once for medium duty. The screen print set-up was a better quality than the flash dryer. Like most other reviews, we found the dryer to be difficult to put together with some metal burrs blocking holes and some problems with threading. But we worked them out with just muscling through. This wasn’t unexpected and I still think it’s a good value for the price. And the warranty makes it worth the risk! This shipped incredibly fast, we got it well before the expected date! It's amazing what $150 can get you these days. No it ain't a Miller or Lincoln, but most people don't need one of those. Once you get it figured it works fine. Oh and don't plan on cutting anything over 3/8. It's rated up to 1/2 inch but I find it hard to believe that it actually will have the balls to do it. Decent product for the price. Does what far more expensive units do. Has performed well thus far.